In this series, Healthcare Design asks leading healthcare design professionals, firms, and owners to tell us what’s got their attention and share some ideas on the subject. Catherine Gow is the principal of health facilities planning for Francis Cauffman Architects (New York and Philadelphia). Here, she shares her thoughts on the changing paradigm of ambulatory care and how it’s affecting the planning and design of new ambulatory health and wellness facilities. Multiple influences are driving today's trends of hardware and access control in healthcare facilities, including increased security needs, evolving technologies and changes to healthcare delivery impacting movement through spaces. 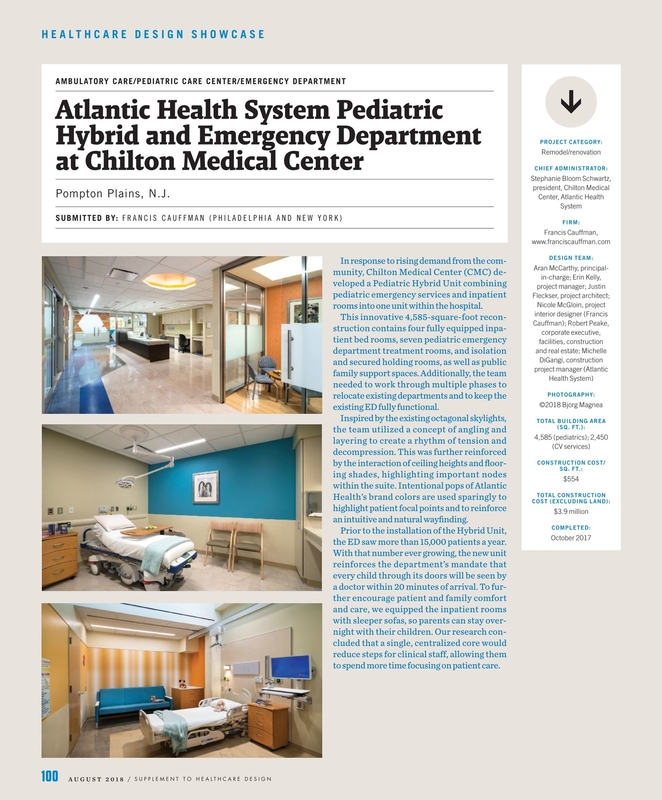 In response to rising demand from the community, Chilton Medical Center (CMC) developed a Pediatric Hybrid Unit combining pediatric emergency services and inpatient rooms in one unit within the hospital. When the New York Hotel Trades Council, a union for hotel and gambling workers in New York and Northern New Jersey, outgrew its health center in Brooklyn, NY, and decided to build its members a replacement facility, two goals were at the forefront.